Nations will beat their swords into plowshares and their spears into pruning hooks. Nation will not take up sword against nation, nor will they train for war anymore. 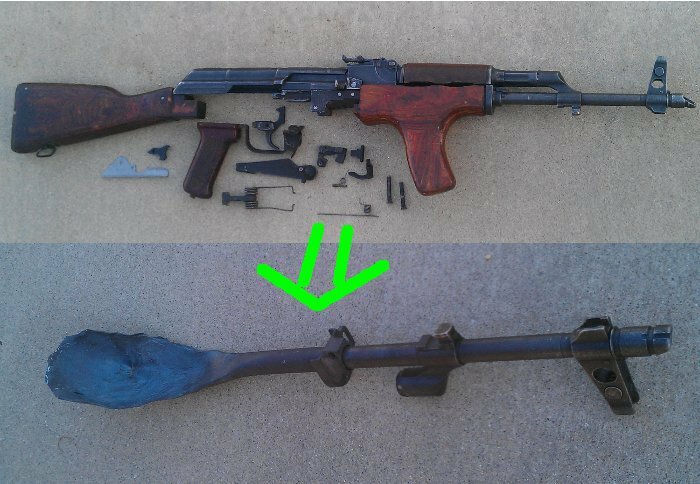 This passage inspired me to convert this former AK-47 into a serving ladle. This fully automatic AK-47 was used by the Romanian army during the Cold War. It could shoot 600 rounds per minute with an effective range of 400 yards. 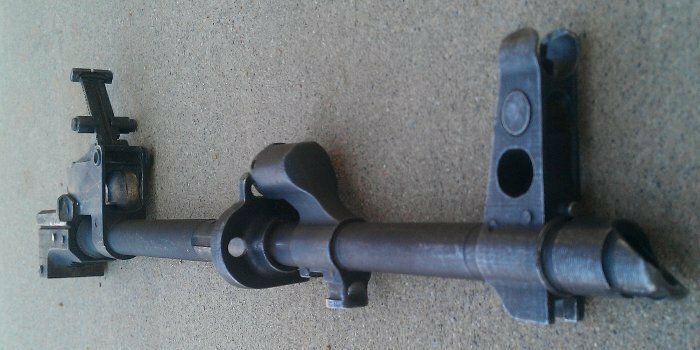 After the Cold War, the Romanians sold these rifles as “parts kits” for hobbyists to build their own rifle. I bought one while I was in the navy, but now I wanted to try doing something a little cooler with it. 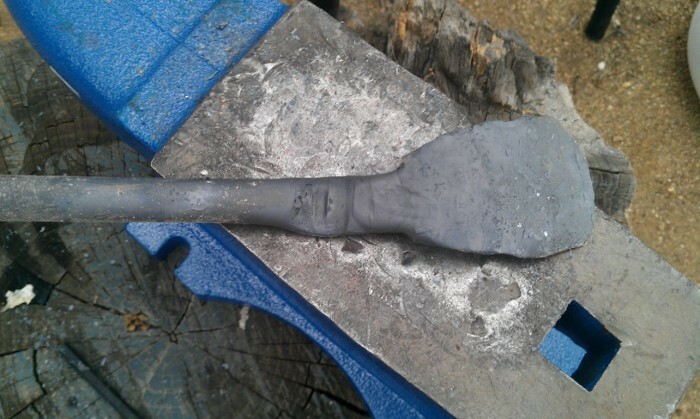 This is a closeup of the the barrel assembly that I actually made into a spoon. I’m still looking for ideas on what to make out of everything else. 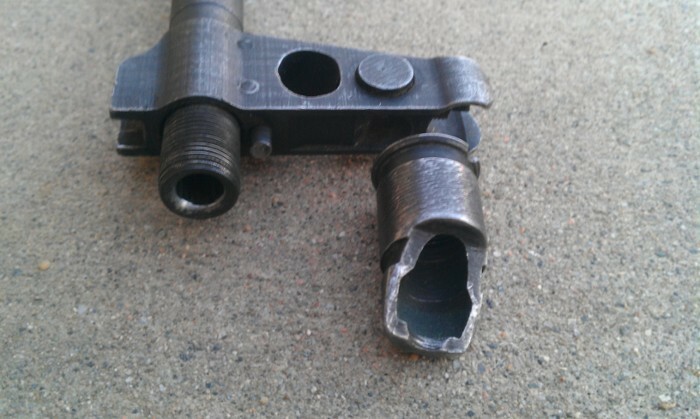 Here’s a closeup of the end where the bullet enters the barrel. 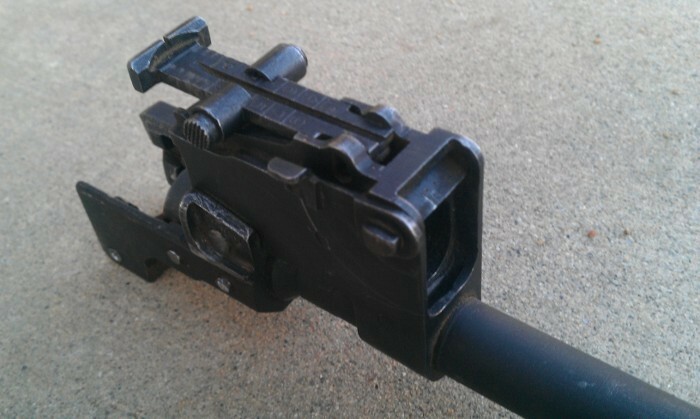 On top is the “rear sights.” This is adjustable to shoot at targets anywhere from 0-800 meters away. 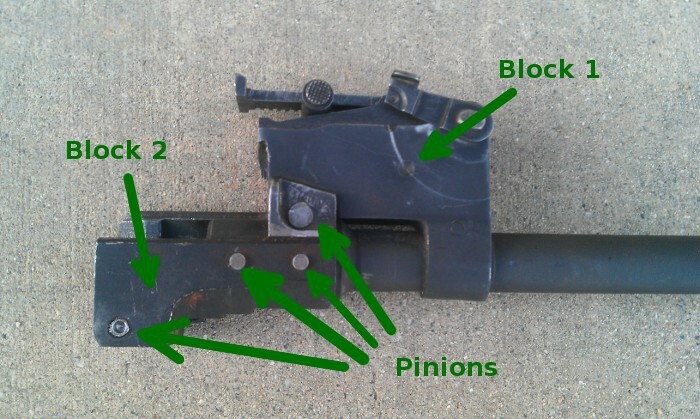 Notice that there’s actually many pieces of metal here—the barrel itself and two large blocks of steel attached to it. These blocks are held in place by “pinions.” These are the circle shaped pieces. If I had a hydraulic press I could push out the pinions and then remove the big metal blocks. But I don’t, so I’ll just beat them off with my forging hammer! 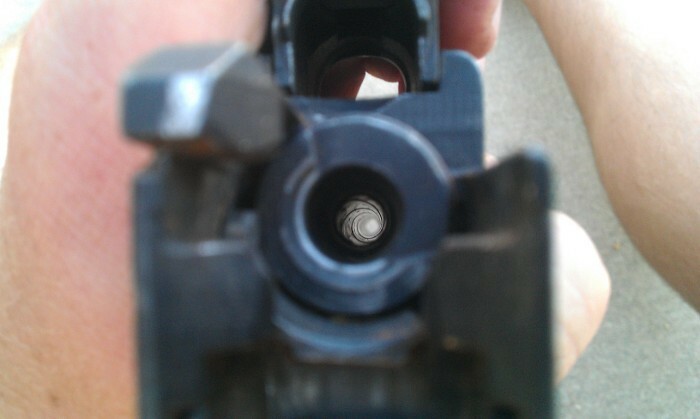 Looking down the barrel. This is where we would insert the bullet when firing. Now for the business end. 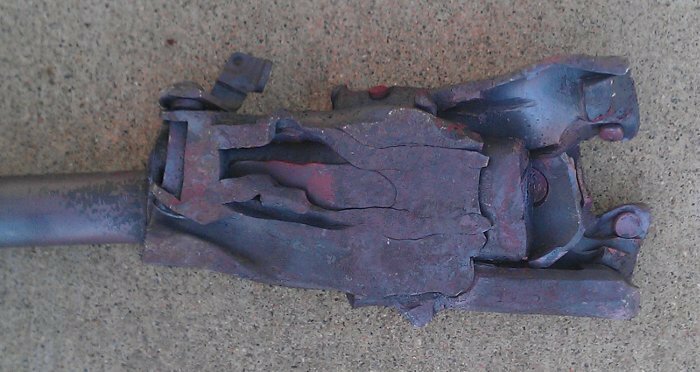 Here I have the flash suppressor removed. The forward sight (the tall thing jutting out to the right) will make a great handle for the future ladle. 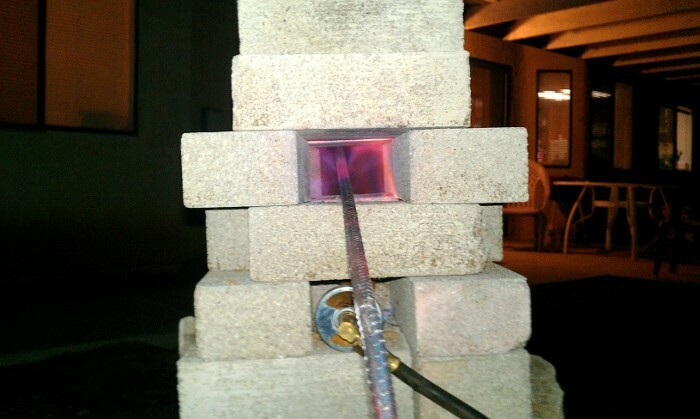 Next, I needed a way to heat the metal. 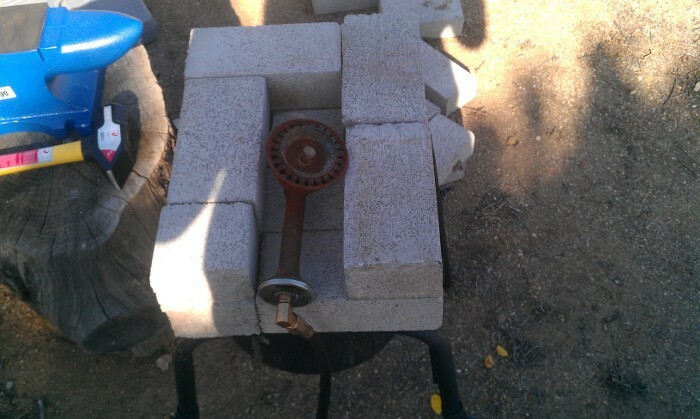 I decided to build a propane forge, because I already had a good burner. The burner came out of a portable stove that we’ve used to serve free chili with a group called food not bombs. The base of the stove is below the bricks, but I unscrewed the burner and placed it on the bricks. Then, I simply stacked the bricks on top of each other to create a nice chamber for the flames. 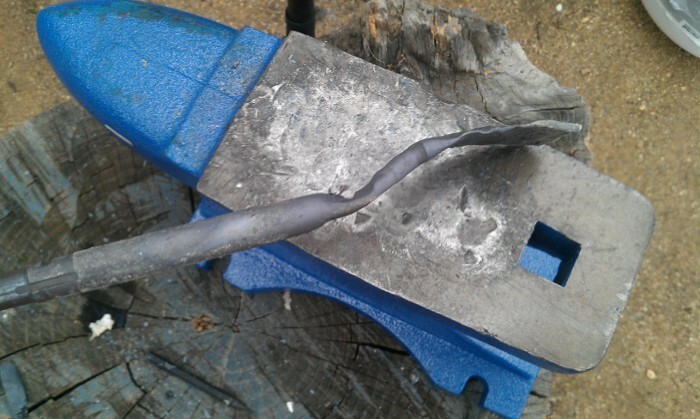 Here’s a picture of a test run with a piece of rebar. The flame is actually gigantic, shooting 1-2 feet past the opening of the forge. The middle of the rebar is a bright glowing orange-yellow, over 2000 degrees Fahrenheit. My camera just can’t do it justice. The bricks are also really cheap. I payed 25 cents each at Lowes. Overall, the whole set up cost less than $100. Let the hammering begin! 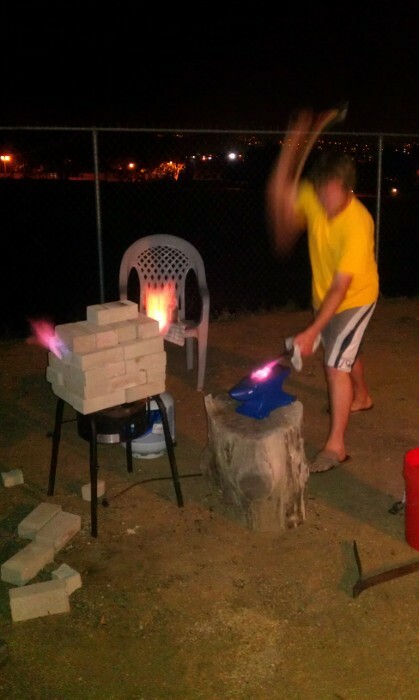 You have to work quickly to hit the metal while it’s still hot from the forge! After just a few hammer blows, look how much the blocks have shrunk. Also, I did NOT have a flash for this. The metal is so hot it’s putting off enough light to light up the wall I’m holding it next to! 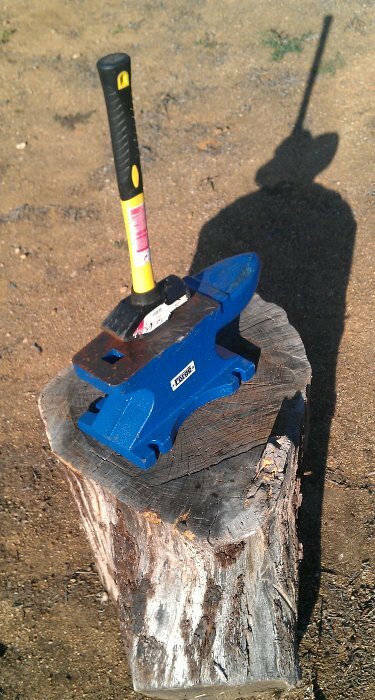 I had to stop hammering after about an hour because of blisters. This is what I was starting with on the next day. Notice that you can still make out the serial number! And here’s a view from the bottom up. After a few more hours hammering, everything’s much flatter. The serial number has long since been flattened away. Here’s the same view from the bottom. 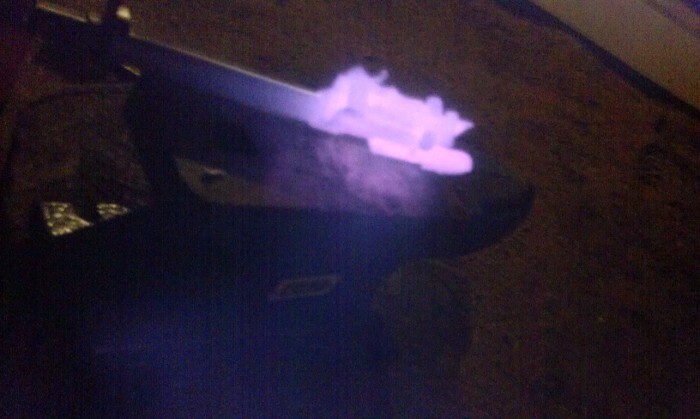 It looks like a ghost! 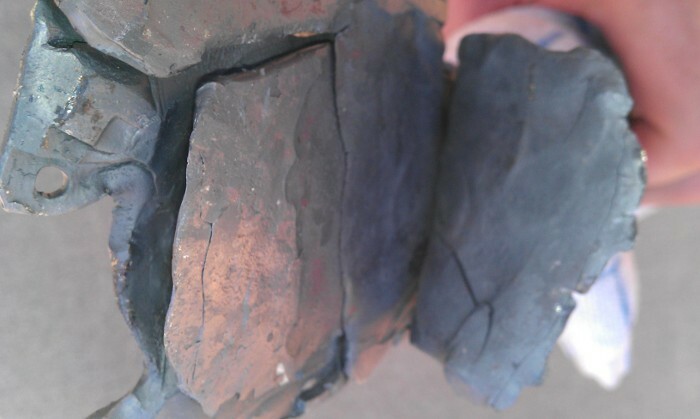 The layers of metal from the attached blocks are quite distinct and starting to get in the way. And the gun barrel itself is now the world’s coolest spatula. All that’s left is to turn this spatula into a spoon. 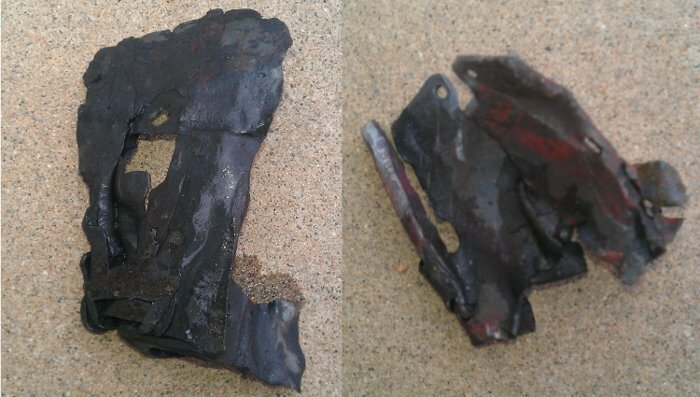 The metal is still pretty thick, so I flattened it out as much as I could. 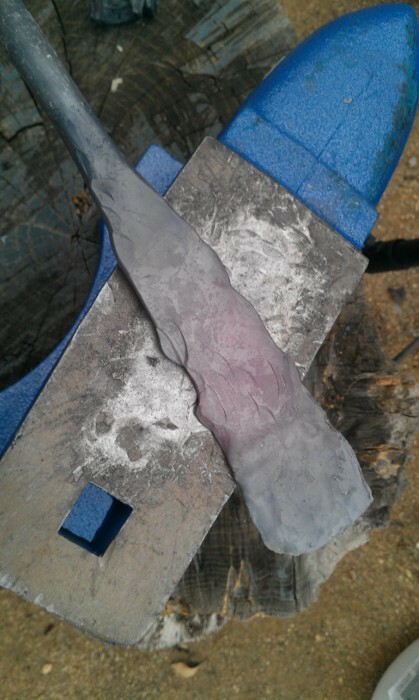 Then I made a spoon shape. I did this by just holding the spatula at a slight angle while hammering. 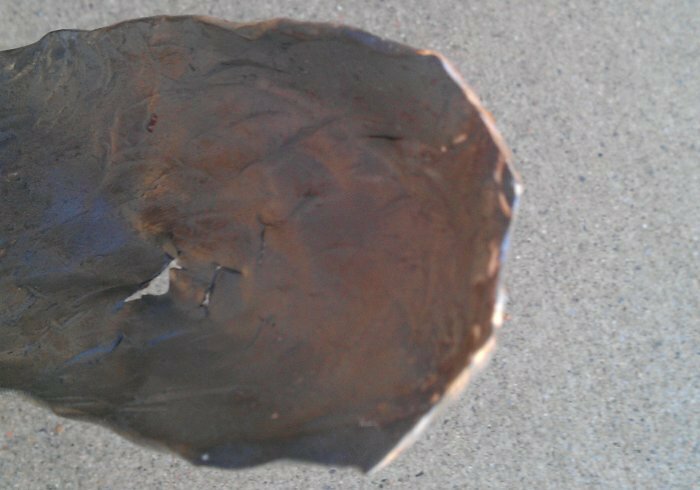 Every blow bent the metal just a little bit until the full bowl shape was complete. I made my spoon about 2 inches too long. Whoops! No worries, I used a Dremel to cut the extra bits off. 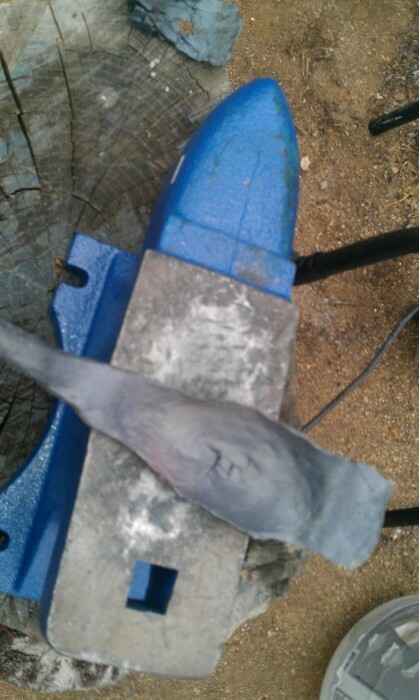 I also used it to smooth around some of the edges. Notice that there’s a little hole in the middle of the spoon. 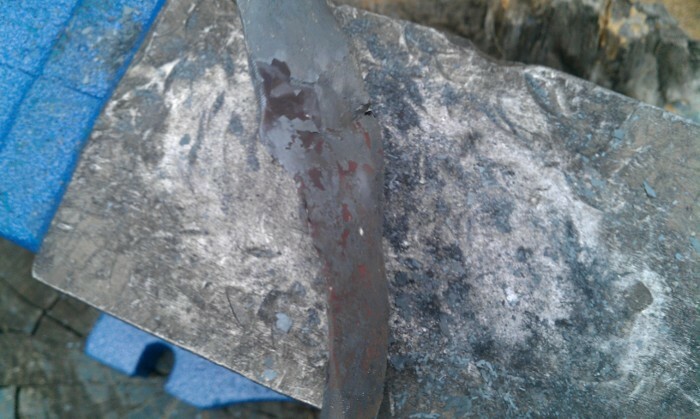 I accidentally hammered the steel too thin and went all the way through. Meh. It’s still good. It’s just a straining spoon now! There’s also a little bit of burnt steel along the sides. Seriously?! Steel can burn? Thankfully, a soak in vinegar and scrubbing brought it out. Thanks to the folks at iforgeiron.com for giving me the tip! 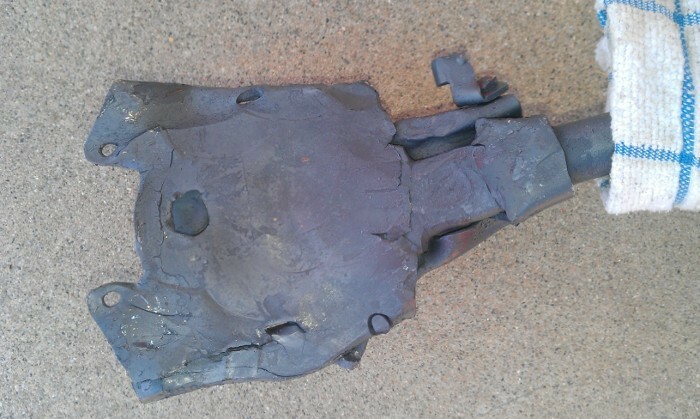 This was my first project with a forge, so things didn’t turn out perfect. But I learned a lot and am still quite pleased with the result. I wish I had some pictures of me eating from the spoon, but unfortunately it’s not food safe. Real gunpowder has been detonated countless times inside this barrel. 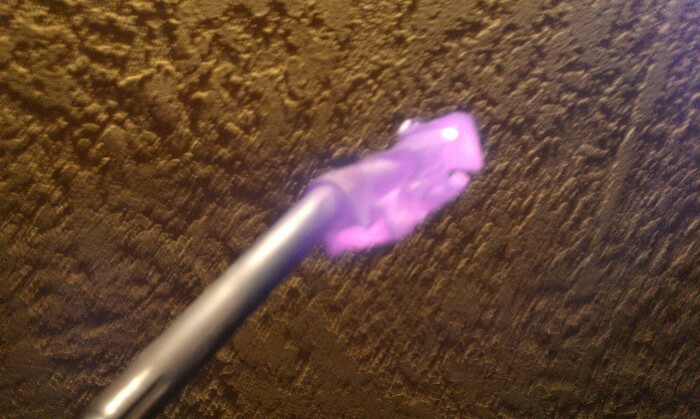 I tried cleaning it as best as I could, but I’m pretty sure there’s plenty of little cancer molecules still hanging out in there.